In this week’s guest article, Patrick Mulick, BCBA, NBCT explains the escalation cycle by which educators and caregivers can evaluate what to expect in their students’ behaviors and how to intervene in the most effective and least intrusive ways. We’ve also included FREE downloadable data sheets so you can try incorporating Patrick’s Escalation Cycle into your program! As critical as it is to change the behaviors of those who escalate, it can be particularly hard to do so in those with autism. The antecedent (trigger) can range greatly from observable events, such as a puzzle piece not fitting properly to a private event that is difficult to predict (such as a strong discomfort from flickering lights in a room). The learner often will exhibit behaviors in attempt to escape the overwhelming experience that they have entered, but those behaviors are often uncoordinated, lack reasoning, and are unsafe. It is here that students may break windows, chase after staff, or hit themselves. And it is here where educators need to be at the top of their game to support a safe de-escalation. This entails knowing the student, knowing their escalation cycle, and having a system by which one can continually evaluate the de-escalation strategies being used. Ten years ago I created the cycle below to help do just that. In many cases, it has been the starting point to great gains for my students who were prone to escalate. Breaking down the cycle into five levels of observable behaviors allows for a much clearer understanding of what to expect. Identifying the appropriate interventions for each level allows for the actions of staff to be the least intrusive and the most effective. It is easy to be reactive in a moment of crisis, yet the moment calls for everyone involved to act in a prescribed manner. Whether it be dimming the lights, providing a break area, or clearing the room of other students, every intervention is with good purpose and good timing. Visually representing all of this for an entire school team, from parents to principals, allows for a better common understanding of the plan and greater fidelity in its implementation. Any issues with ineffective supports used at the wrong times can be quickly weeded out, and any staffs’ fears who interact with the learner can be eased. To allow the school team more depth or specifics, this overlay can be used to spell out more details. Knowing that a plan is being implemented with higher fidelity, we can then begin to look at data. A standard A-B-C data sheet for specific incidents should suffice in tracking the plan’s effectiveness. 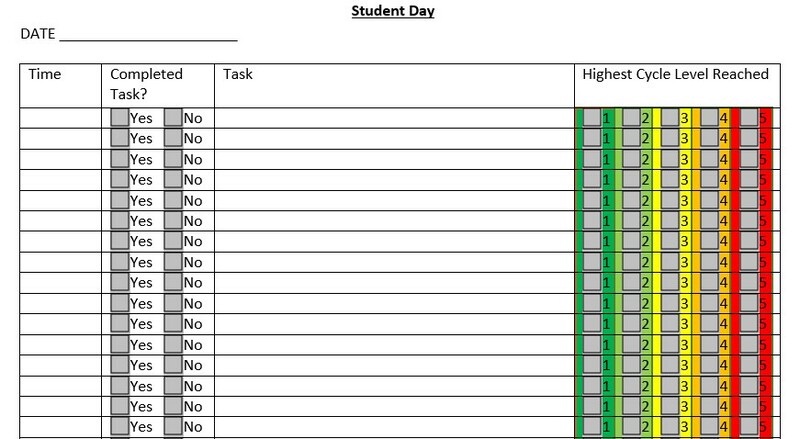 Where the above tools can help most significantly is in the coding of behavior clusters, which can then be tracked in the student’s day, such as on a chart similar to the below. 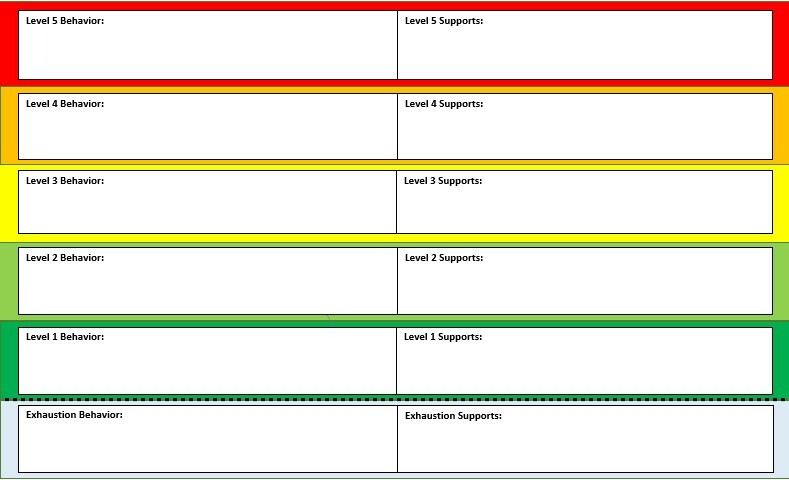 As the student progresses through their tasks and activities, staff indicate the highest escalation cycle level the student reached, even if only for a moment (think partial interval recording). This tracking done all day, every day, provides teams with data that can inform the effectiveness of the de-escalation techniques being used. For example, learners with a tendency to become aggressive are generally perceived as escalating with high frequency. Utilizing objective data tracking can substantiate such subjective perceptions, more clearly showing the frequency of escalation behaviors and if they are improving week to week. Working from a place that is measurable and observable can help move your team from being reactive to proactive, fearful to confident, and from helpless to equipped. Patrick is the Autism Specialist of the Auburn School District in Washington State. Over his twelve years as a teacher and consultant, he has grown to have a particular passion for equipping school teams that support students with autism. Patrick enjoys engaging educators through his hybrid of inspirational and instructional speaking. He is currently working toward becoming a certified member of the John C. Maxwell Leadership program. To learn more, visit his website at www.patrickmulick.com. Written by: Different Roads to Learning on October 22, 2015.on October 21, 2015. This entry was posted in ABA, Academics, Applied Behavior Analysis, autism, Behavior, From the Experts, Resources and tagged ABA, Applied Behavior Analysis, autism, autism education, autistic spectrum disorder, behavior management, behavioral interventions, crisis intervention and prevention, Escalation Cycle, free download, Resources, special education, special needs, teaching, teaching tools by Different Roads to Learning. Bookmark the permalink.